Post Workout Drink: Whey protein is digested and absorbed much quicker than most post workout protein supplements (such as casein in milk) and immediately provides the body with branched chain amino acids (BCAAs), which are the first amino acids used during physical activity. This means the first amino acids to go, are the first to be replaced so the body can begin repairing and rebuilding muscle tissues right away. Weight Management: Cholecystokinin (CCK) and glucagon-like peptide-1 (GLP-1). What are those, other than ridiculously hard to pronounce? They are two appetite-suppressing hormones that whey protein helps to stimulate. This means not only does whey protein help to rebuild muscle after a hard workout, but it also suppresses those hunger pangs, which can help with weight management. Adding whey into your breakfast cereal milk or a protein shake can help stave off the hunger pangs for a bit longer, preventing guilty snacking when rummaging through the pantry like a starving child. Aging management: No one wants to get older and weaker…so don’t. Keeping up with your protein intake can keep your muscles strong, even when aging threatens to weaken them. Adequate protein consumption will prevent muscle loss as well as bone loss. -Spinach (try it before you gag and write it off)! 3. Add in your blueberries, blackberries, and banana (and whatever other fruits you prefer). 4. Scoop in the small yogurt packet and mix together. 5. Once mixed, add a handful of spinach (you won’t taste it but it will add loads of extra nutrients). 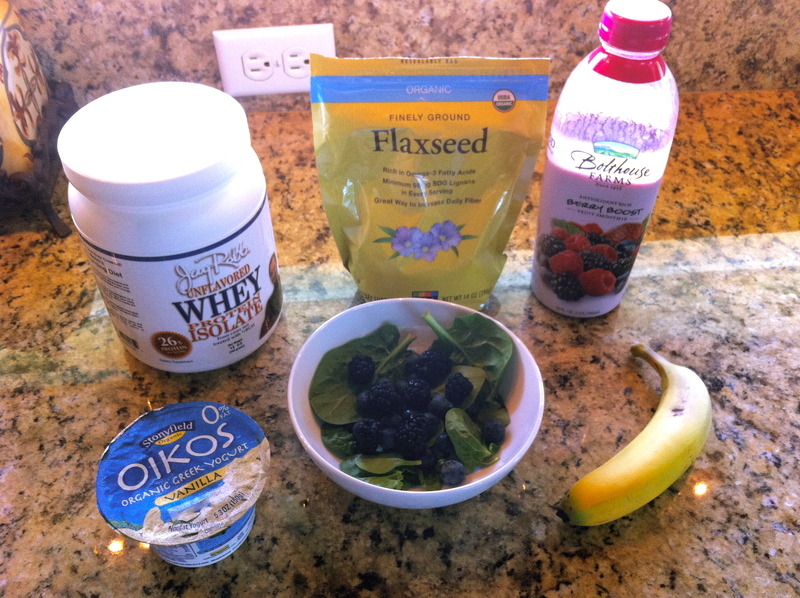 Mix again with spinach. 6. Throw in three or four ice cubes to chill it and mix those together as well. This entry was posted in Fitness/Workouts, Nutrition Facts and Tips and tagged exercise, fruit, nutrition, protein, smoothie, weight, whey, workout. Bookmark the permalink.